Be sure to sound off in the comments,we want to hear your take as well. Edward Snowden is an American Hero !!!!!!!!!! 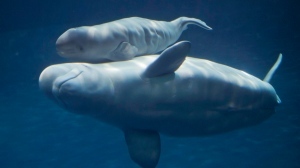 Beluga Nursing Grounds in the St.Lawrence River- TransCanada Corp, the company behind the controversial Keystone XL pipeline, is scrapping plans for a Quebec oil-export terminal because of danger to whales in the St. Lawrence River, a move that is a victory for environmentalists and which delays the company’s C$12 billion ($9.5 billion) Energy East pipeline project. An environmental non-profit group is calling on the federal government to designate the St. Lawrence Estuary as a protected area. The Canadian Parks and Wilderness Society says the designation is essential in order to protect the estuary — which stretches from Métis-sur-Mer to Baie-Saint-Paul — and the threatened and endangered species like beluga whales, blue whales and fin whales that inhabit its waters. With TransCanada Corporation proposing to build a port in the estuary for shipping more than a million barrels of Alberta oil east, that means the designation is needed now more than ever, says CPAWS Quebec Director, Patrick Nadeau. “To build it in the first place there is some very heavy-footed operations that need to happen, then once the port is in place we’re expecting these huge supertankers and in case of a spill in that area it would have some irreversible and really dire consequences,” Nadeau told CBC News. Nadeau said that’s a significant change. “We’re a bit dumbfounded, to be honest, because this ministry for 15 years has been pushing the project, but now all of a sudden it’s a simple area of interest,” he said. Canada currently has 10 Marine Protected Areas, which Nadeau said is only a fraction of the areas that need federal protection. “Right now we’re only protecting 1.3 per cent of marine environment, which is quite pathetic,” he said. “Countries such as China and Russia are doing better than us,” he said. A Marine Protected Area designation would not mean the end of the TransCanada project in the St. Lawrence Estuary, he said, but it would add an important measure for preserving its fragile ecosystem. Fisheries and Oceans Canada did not return a request for an interview with CBC News. What’s the latest on this issue ? CALGARY, Alberta (Reuters) – TransCanada Corp, the company behind the controversial Keystone XL pipeline, is scrapping plans for a Quebec oil-export terminal because of danger to whales in the St. Lawrence River, a move that is a victory for environmentalists and which delays the company’s C$12 billion ($9.5 billion) Energy East pipeline project. Federal protection of the St.Lawrence estuary required. It seems an image of human tenderness that Sudan is lovingly guarded by armed men who stand vigilantly and caringly with him. But of course it is an image of brutality. Even at this last desperate stage in the fate of the northern white rhino, poachers would kill Sudan if they could and hack off his horn to sell it on the Asian medicine market. Sudan doesn’t know how precious he is. His eye is a sad black dot in his massive wrinkled face as he wanders the reserve with his guards. His head is a marvellous thing. It is a majestic rectangle of strong bone and leathery flesh, a head that expresses pure strength. How terrible that such a mighty head can in reality be so vulnerable. It is lowered melancholically beneath the sinister sky, as if weighed down by fate. This is the noble head of an old warrior, his armour battered, his appetite for struggle fading. Under his immense looming shoulder, his legs protrude like squat columns from the tough tank of his body. The way his foreleg emerges from his thick coat of skin reminds us how long human beings have been wondering at the natural spectacle that is the rhino. For Sudan does not look so different from the rhinoceros that Albrecht Dürer portrayed in 1515. They have the same little legs stuck out of a majestic body and they even lower their heads in the same contemplative way. Dürer was a Renaissance artist picturing an exotic beast from the exotic lands that Europe was starting to see more and more of. In 1515 a live Indian rhinoceros was sent by the ruler of Gujarat to the king of Portugal: he in turn sent it to the Pope, but on the way it died in a shipwreck. Human beings – we always kill the things we love. We have been doing so since the ice age. There are beautiful pictures of European woolly rhinos in caves in France, that were painted up to 30,000 years ago. These ancient relatives of Sudan share his heroic bulk, mighty power and paradoxical air of gentleness. A woolly rhino in Chauvet cave seems agile and young, a creature full of life. But the same people who painted such sensitive portraits of ice age rhinos helped to kill them off. As climate turned against the woolly megafauna with the end of the last ice age, human spears probably delivered the coup de grace.